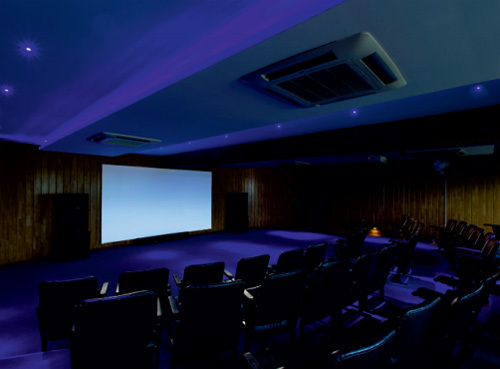 In the 3rd floor of Club House Building a Home Theatre with a seating capacity of 100 people with Blue Screen facility has been provided. Multi Lingual Cinemas are screened on rotation basis all the days in a month. This is a unique facility not found in any of the Clubs in Bangalore. Our Members are extensively spending their evening with their families viewing the films in the theatre. There is only one show every day starting at 6.30 P.M and there is no entry fee. We have provided a walk-in Library with more than 4000 Titles of Kannada and English languages and different subjects, periodicals, magazines, etc. The reading room is unique as it provides a calm and peaceful atmosphere. It is open on all days in a week from 10.30 A.M. to 8.30 P.M. The Club is having covered Parking facility for 300 Cars and Two wheelers in the Cellar of Bowling Alley Building, Lower basement, Upper basement and Ground floor of the Club House building. There are 13 Guest Rooms with 5 Star style and well furnished with Double Cot. They are all with central A.C. and wooden flooring and well equipped Bath Rooms. They are maintained with high standards. The tariff is easily affordable. It varies from minimum amount of Rs.1,755/- to Rs.3,630/-. There are two party halls in 2nd floor of Down Town Building. They are well furnished with graphics and well maintained. 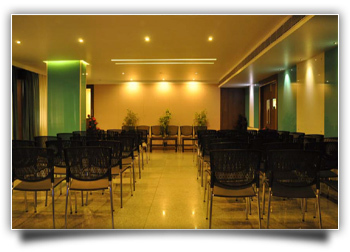 The Big party hall is with a capacity of 60-70 and Mini party hall accommodate about 25-30 persons. 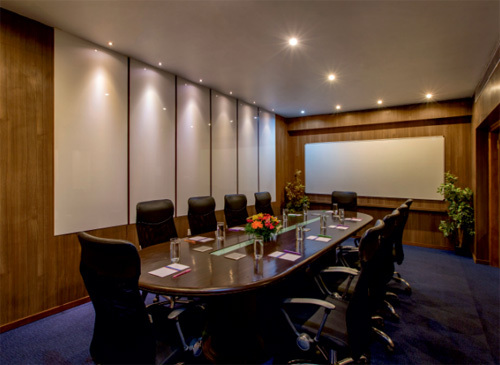 Adjacent to party halls, there is a Conference hall equipped with necessary accessories for presentation during discussion/seminar. A Spacious Bar/Restaurant with Ultra Modern Kitchen serves ethnic North-Indian, South Indian, Chinese and Tandoor Cuisine. There are four Bar/Restaurant sections in Down Town Building and two in Club House Building. In the 1st floor of Club House Building, a Luxurious Presidential Lounge is provided which has the Victorian furnishings with carved furnitures. This is one of the best Bar section in Bangalore and the lights and interiors are enhancing the ambience of the Lounge. Sky Lounge: There is a Sky Lounge with Bar and Restaurant on the roof top of the Club House. This Roof Garden is great in demand by our Members as it is over looking BBMP Sports stadium, provided with imported high quality furnitures. The main attraction is that a wide cinema screen which entertain our Members to view live Cricket and Sports. This has been designed with good landscaping, fountains and fish aquarium. It is open only in the evening from 6.00 P.M. to 11 P.M. on all days. There are two separate A/C and Non A/C Bar Lounges located in the first floor of the Down Town Building. It is well furnished with comfortable sofas, curtains, carpets, paneling, imported light fittings and utmost care is taken to maintain a cool and calm environment. They are exclusively reserved for Members only. Pavilion Lounge: In the Down Town area, a Pavilion Lounge overlooking a huge Corporation Stadium is recently added for Members to enjoy their evenings. 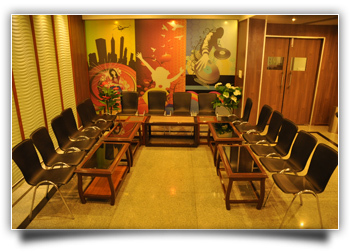 It has good ambience with complete open on all sides and a mural paintings on its surroundings add beauty to the lounge. In all Bar and Restaurant sections, food and liquors of both Indian and Foreign liquors are served. The best and the cleanliest wash rooms and toilets at all points with ultra modern fittings are provided. Provides a Travel House to meet the travel requirements of Members. Special Discounts allowed up-to 5% of the cost on all travel products. Managed by the professional Travel agency viz. Vacation Exotica. A high-tech Beauty Parlour is provided. It is run by highly qualified beauticians and technical people to provide the best service. The Beauty Parlour is also attached with both Ayurvedic and Allopathic treatment of massage along with Sauna, Steam & Jacuzzi’s. It is located on 22nd Cross in between SUBZ and Reliance Fresh- Departmental Store. It is open from 8 A.M. to 8 P.M. It is housed in a beautiful architecturally designed building. 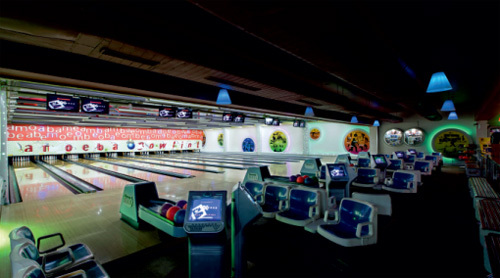 12 Lanes of International standard Bowling Alley are provided for the use of the Members and others. 2 Lanes have been exclusively reserved for Club Members. This has been one of the most attractive Sports joint for the youths in the South of Bangalore. It goes with Chatney Chang Restaurant and a Subz, a pure vegetarian section. It is being managed by a professional Group viz. M/s H.M. Leisure’s Pvt. Ltd., Bangalore.